I’m on my flight home from another incredible trip to Europe. This time, my sisters, mom and I spent three days in Portugal and four days in Spain. I’m going to give a full rundown of our itinerary here in this post, and then share some more specific thoughts and reviews on some of the specific places we visited in upcoming posts. 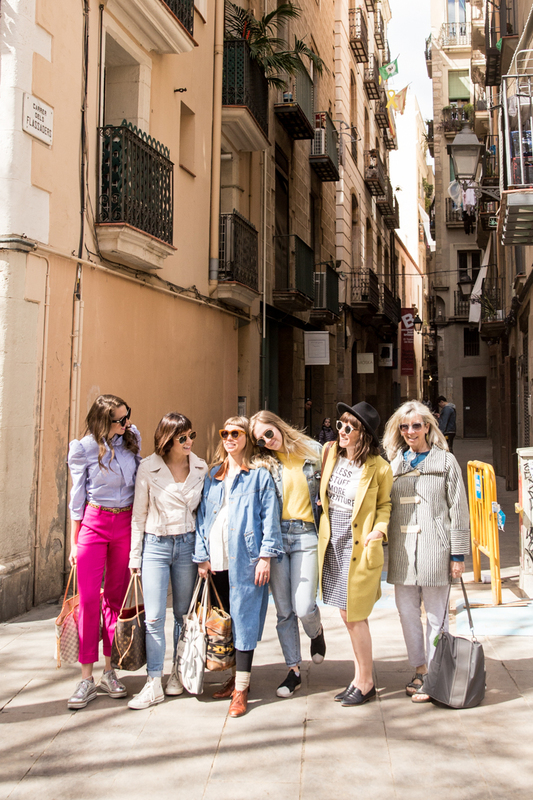 When we plan girls trips, we usually start with a really wide idea of places we would like to visit, and then narrow it down based on the time of year, length of the trip, and our individual budgets and preferences. We also keep an eye on airfare to several options and see what looks like it might have good prices for when we want to travel. This time, we had talked about Spain, because several of us had never been, and those who had had loved it. We also decided to add Portugal because that was a new destination for everyone, and was so close we thought it would be fun to get a taste. I had seen several friends go to Portugal recently, and it looked incredible. Ultimately the flights worked out best to fly into Lisbon, Portugal. We spent a couple days in and around Lisbon and the coast, then flew to Barcelona, Spain for the remainder of the trip. 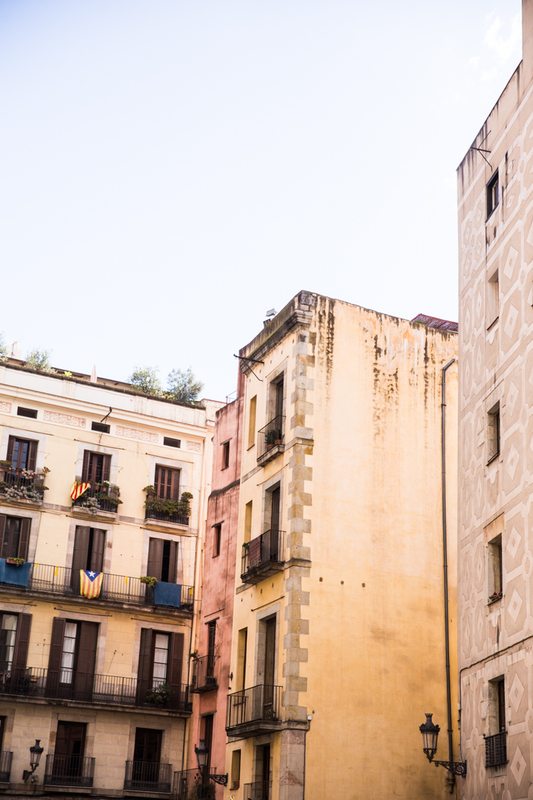 We also had considered seeing one other city in Spain while we were there and decided that we would rather dig in a little bit in one place than spend so much time traveling around. I would almost always choose to spend more time in fewer places when I travel, to really get the vibe and experience. Both Portugal and Spain were amazing, beautiful, historic, and entertaining. I’m excited to return someday. We landed in the early evening to the airbnb, and went out to wander the town and have dinner. 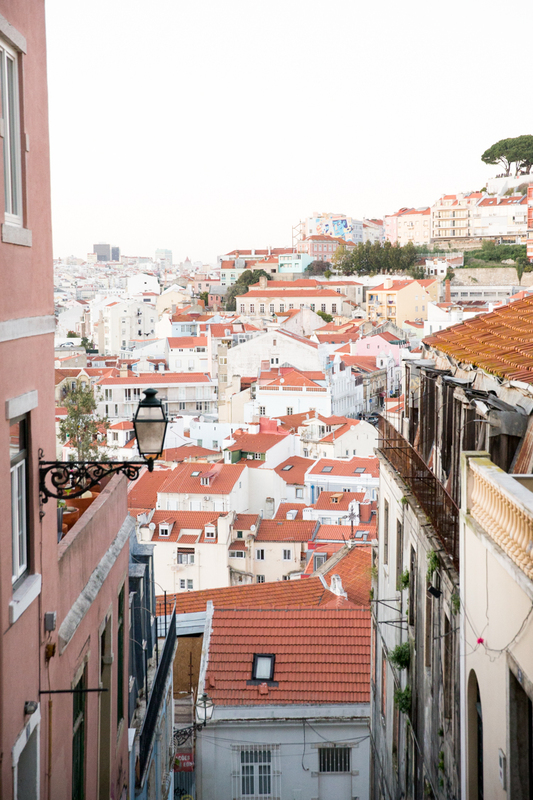 The streets of Lisbon are hilly, narrow, and layered. We rented a car knowing we wanted to drive to the coast one day, and that is something I would definitely not recommend. The streets are super narrow, busy, and there is not a lot of parking. Uber works perfectly and is inexpensive for a group. The city is also walkable. When we return, we’ll take the train if we want to get out of town. The restaurant we had planned to eat at (Ze Da Mouraria) was closed, so we ducked into a little hole in the wall that was very very local. It was nice to sit and eat, and we got an upclose feel for the local specialties: cod, octopus, cheese, and olives. Turns out no one in our group was a huge fan of the cod or the octopus, but we ate lots of cheese and olives the whole trip. After a quick dinner we took Uber down to a small restaurant to experience live Fado music, which is a local type of singing. It is a little folksy and emotional. The little bar we found had a couple guitars and one singer, and we got a feel for the traditional music. We also had incredible chocolate cake with lemon ice cream. Early day two we headed out and stopped in at Manteigaria for traditional Pasteles de Nata and hot chocolate. The pasteles de nata are everywhere in Lisbon, but we heard this was the very best place to get them, and they did not disappoint. They are a fine, layered crust similar to phyllo dough, with a sweet egg custard filling. We ate them warm in the car on the drive to Sintra, and cold in the car on the way home. Both are delicious. 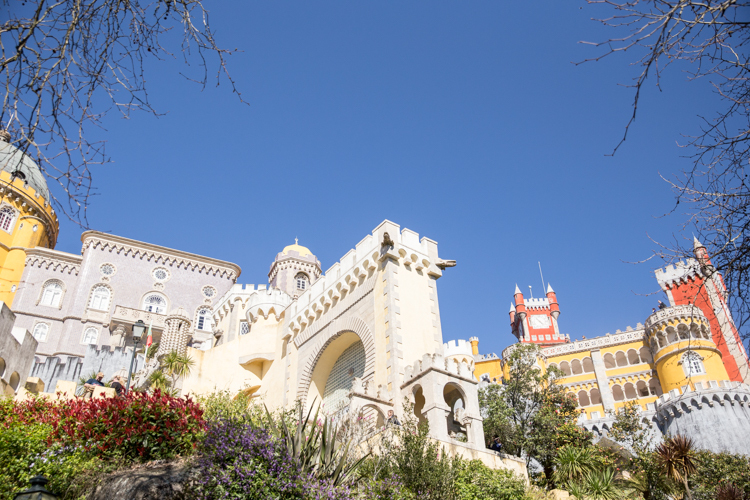 In Sintra we drove up the mountainside to the Pena Palace. Wow, what an amazing place. It is covered in tile, and painted in vibrant reds and yellows. We didn’t do an interior tour, and had heard we needed to arrive early before it got too crowded, which was nice. It opened at 10am, and we arrived just after. The grounds are beautiful, and we had lots of fun taking pictures and admiring the palace. Lunch was one of our favorites of the whole trip, down the hill from Pena Palace, but still just outside of the main city square at Tascantiga. 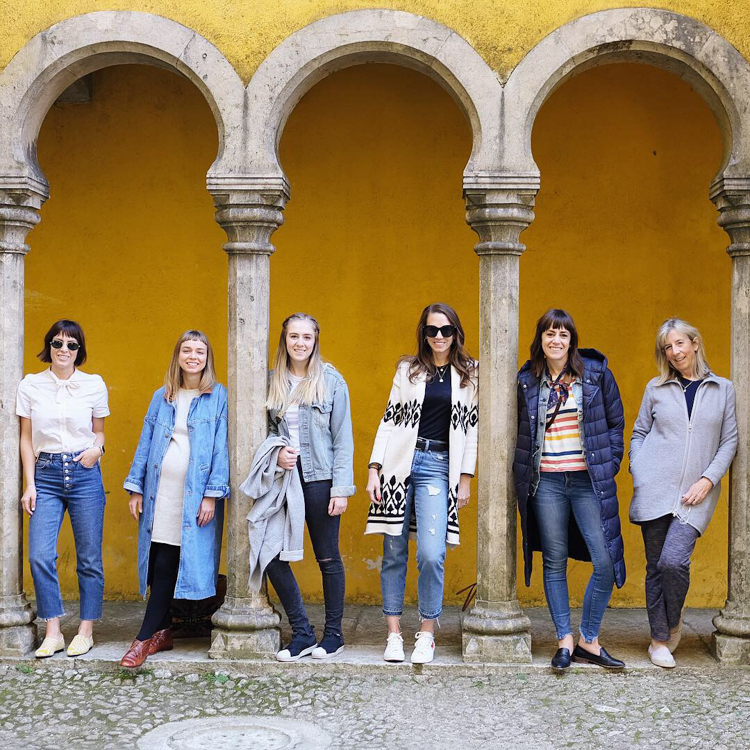 This, and so many of our other Portugal recommendations came straight from Izzy Harris’ fantastic YouTube series about her trip. At Tascantiga we ordered piles of tapas and loved the variety. The location was so cute, outside and in, and the experience was lovely. We would definitely recommend it. 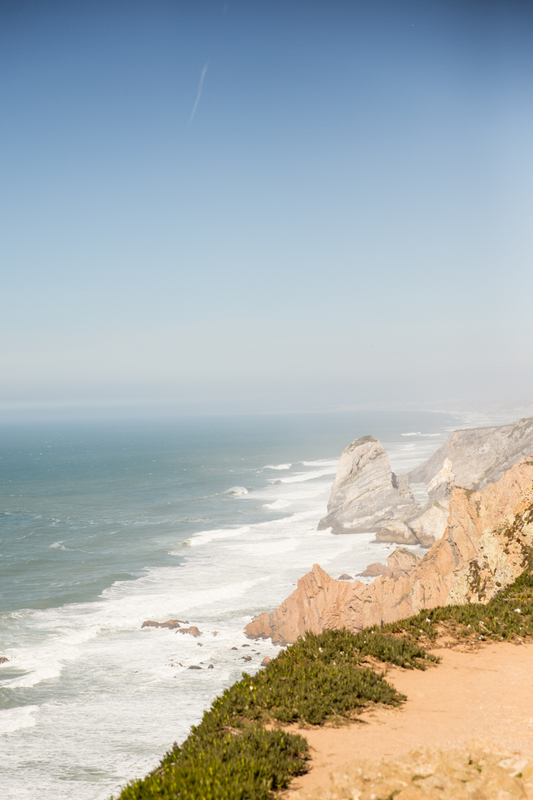 Before heading back to Lisbon we decided to stop over at Cabo Da Roca, which is the western-most point of continental Europe. It was a beautiful overlook with a lighthouse and was a nice, easy place to stop for a walk around outside. Once back in Lisbon, we stopped at the Belem Tower by the river, then sat and drank lemonade outside by the water. Sometimes that hour or two of downtime is really fun. After resting, and finding a cute frozen yogurt truck, we headed over to ride the Tram 28 on it’s scenic route through downtown Lisbon. It was rush hour, and the locals use the trolleys as transportation, so it wasn’t the very best view for us. I would recommend doing that on an early day of your visit to Lisbon, and going around 10-11am when the cable car isn’t as busy. After that ride around town, we headed over to check out the LX Fabrica neighborhood. It was really cool. 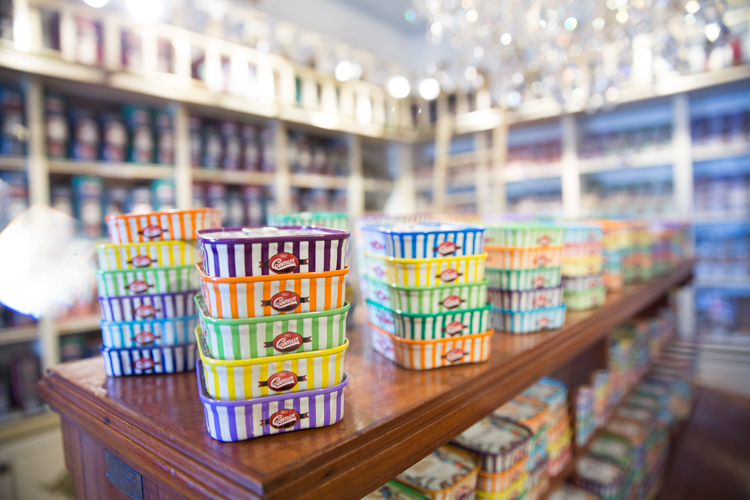 Lots of local shops and bookstores, live music playing in the cafes, treats and souvenirs. A really cool, clean, vibrant spot to explore. We planned to have dinner somewhere cool that had been recommended, and they didn’t have space for us (a good reminder to MAKE RESERVATIONS!) Instead, we had dinner at a little place just a few minutes walk away, and it was delicious. 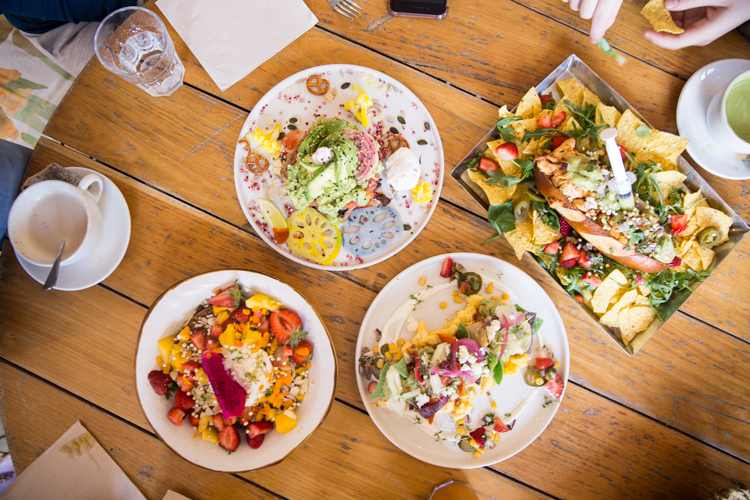 We ate every meal of the trip family style, ordering a bunch of small plates and sharing. Then we finished each meal with a big selection of deserts to share. Not a bad way to travel. 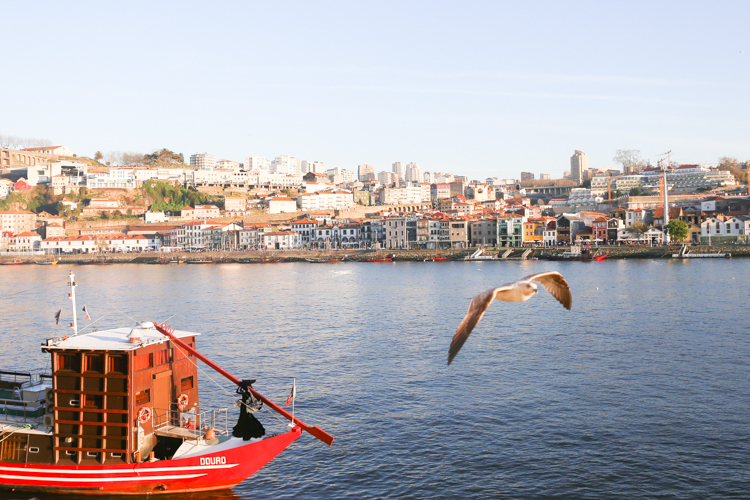 Friends, if you go to Portugal, please go to Porto. 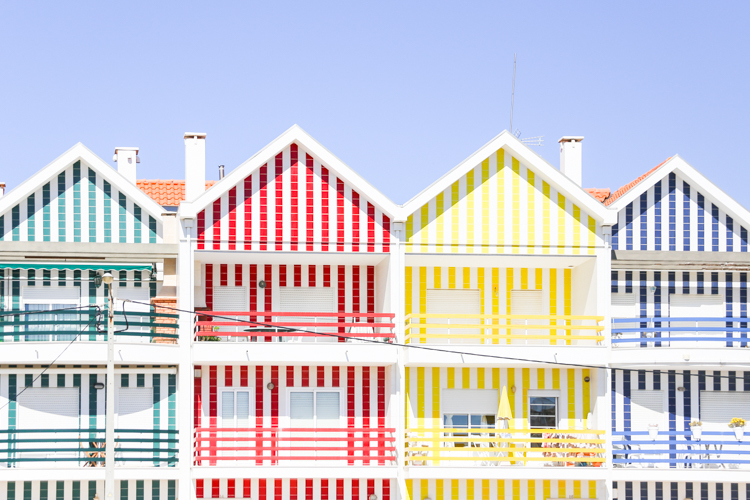 It is about a three-hour drive from Lisbon, and an even shorter train ride. We stopped briefly in Obidos (a small walled village, that was cute, but not worth the stop), and Aveiro (a cute beach town with darling stripped buildings, but again not worth a full stop.) When we finally pulled into Porto we were floored. It is breathtaking. 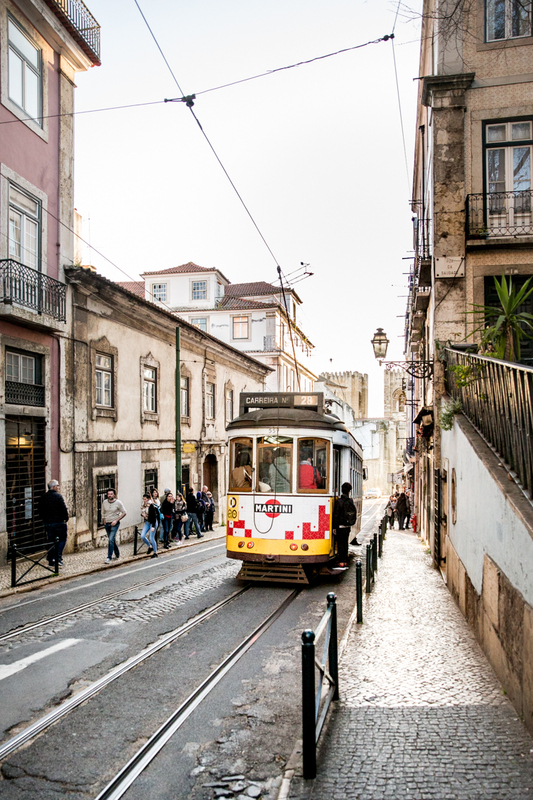 The whole city feels a bit more dramatic, ornate, charming, and personal than Lisbon. 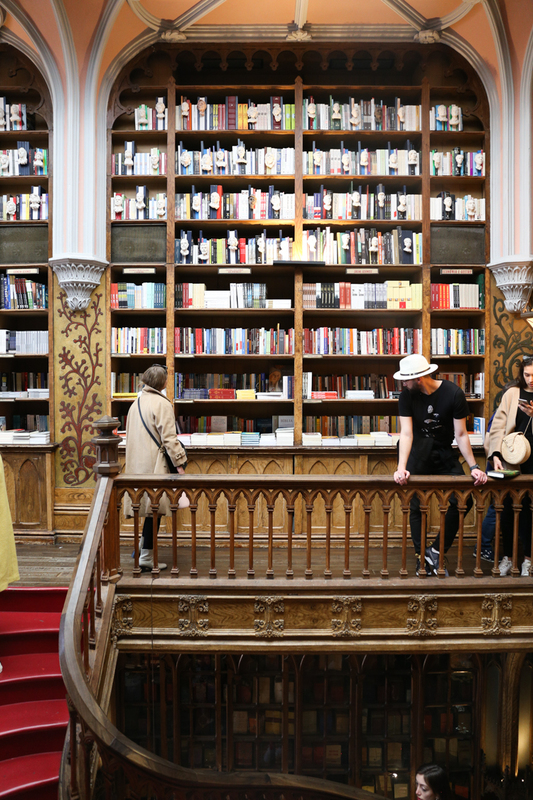 Our first stop was the Liveria Lello Bookstore. It is incredible. Famed as one of the oldest bookstores in the city, it is where J. K. Rowling is said to have been inspired for different pieces of the Harry Potter stories. An entrance ticket is 5 Euro, which is deducted from any purchase you make. I found a cute Easter book for my kids and asked them to stamp it with the store stamp, which is really cool. The waterfront in Porto is beautiful. We planned to take a boat ride, but arrived just after the last boat of the night took off. Instead, we wandered across the bridge and admired the view. We took a short tour of the Burmester Port Wine Caves, which are just on the other side of the bridge. I don’t drink wine, but it was still cool to learn more about the process. 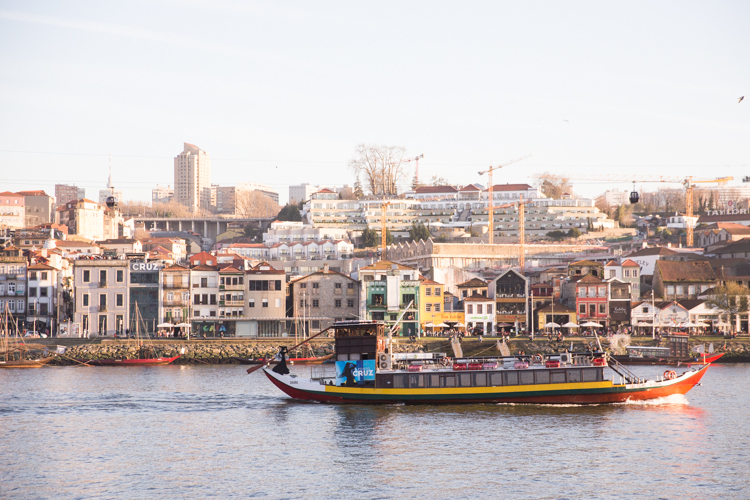 We had dinner in Porto on the opposite side of the river from the main city, at a little riverside restaurant called Taberninha do Manel. This place had amazing tapas, and some of the best bread of the whole trip. We also love loved the deserts in jars. Overall super good. We chose an afternoon flight to Barcelona so that we could enjoy one last morning in Lisbon, check out of our Airbnb (get $40 off your first stay right here! 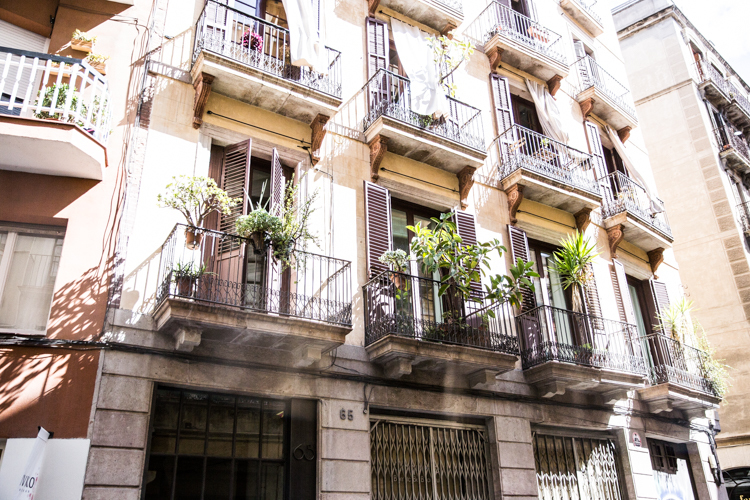 ), then travel in time to check-in to the new airbnb when we arrived in Barcelona and have the evening there. It worked out beautifully. This morning my sister and I went on a long run (I shared all about running while on vacation in this post.) Everyone else went to a flea market to browse and shop. After our run, my sister and I walked up the hill from our apartment and saw the line for the Castle de Sao Jorge. We didn’t visit it, but is sure looked popular! I have definitely made peace with the idea that I cannot see and do everything on vacation, so I try to not feel bad and just stay present in whatever I am doing and enjoying! It was nice to have one last day to wander the streets. I picked up a can of sardines and tuna to bring home. Apparently sardines are a big thing in Portugal, and even though I’ve never tried them and am not sure I will like them, it seemed like a fun souvenir. I also grabbed a beautiful piece of hand-painted pottery that I can use for our family’s many picnic boards and casual dinners at home. The flight to Barcelona was about two-hours (longer than we expected!) and we took a taxi from the airport to our airbnb. In Barcelona at the moment Uber has been restricted, so it isn’t functioning. We were surprised how inconvenient that was. When we had been used to using Uber for all of our trips around town and having them come get us where we were, knowing the fare ahead of time, etc. Taxis were fairly easy to hail along main streets in Barcelona, but the fares were much higher than Ubers had been in Portugal. The first night in Barcelona we walked down the Main Street to Parc de MontJuic for the Magic Fountain water show. It was incredible! If you visit, definitely look up and find a night that it works for you. The plaza fills up with people about 30 minutes before the show and there are really no bad views. We ended up sitting on the stairway near the overpass. We had dinner at Casa De Tapas Canota, in the Born neighborhood. It is owned by the same company that runs a couple other good local restaurants. We were a little surprised by the cartoon motif (it was a little cheesy, and definetly more geared for families with younger kids). The food was good, though. Back at the apartment we wound down, chatted, uploaded photos to instagram and slept soundly! Day five of our trip was Sunday, so a couple of us went to attend church meetings in the local ward. I served a mission for my church in Argentina, and loved hearing the hymns and messages in Spanish. It felt like home in some ways. 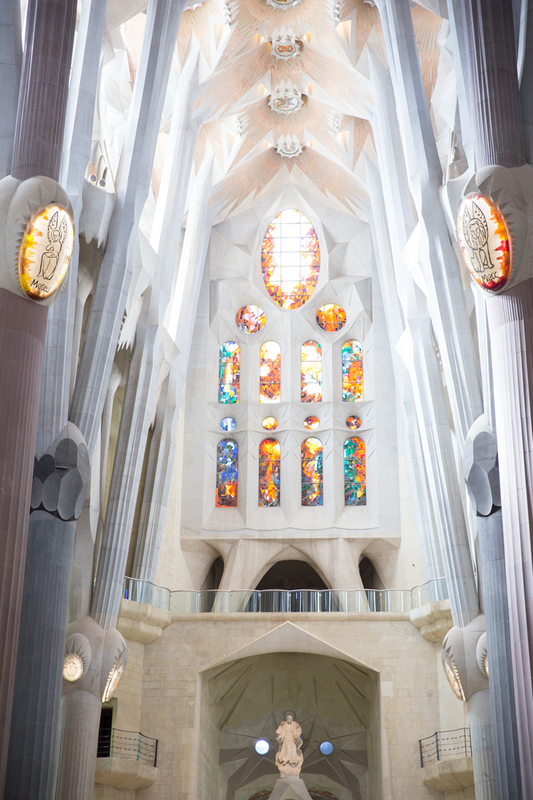 At 10:30am we met at the Basilica de la Sagrada Famlilia. This is my number one MUST SEE in Barcelona. 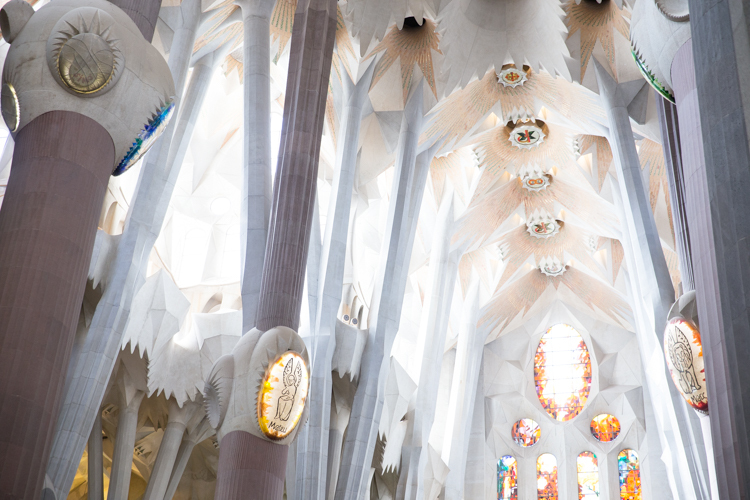 It is an otherworldly cathedral designed by famed architect and designer Antoni Gaudi. Construction began in 1926 and is on track to be completed in 2026 to commemorate 100 years of work. 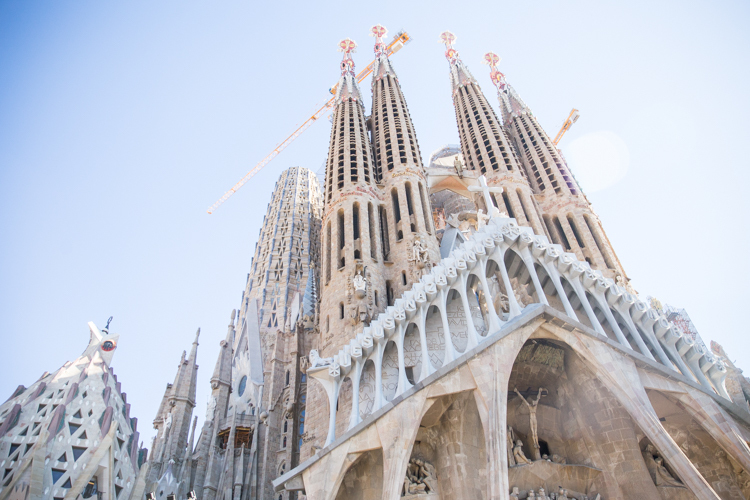 The lines are long and tickets sell out, so be sure to buy yours ahead of time online, where you can also buy a combination ticket to see Parc Guell and other Gaudi designs. I absolutely was blown away by this building and fully intend to return to Barcelona sometime after 2026 so I can see the building completed. After enjoying the Basilica, we walked two blocks down the street and ducked into Casa Angela for lunch. I loved the Spanish Tortilla, as well as everything else we ordered. 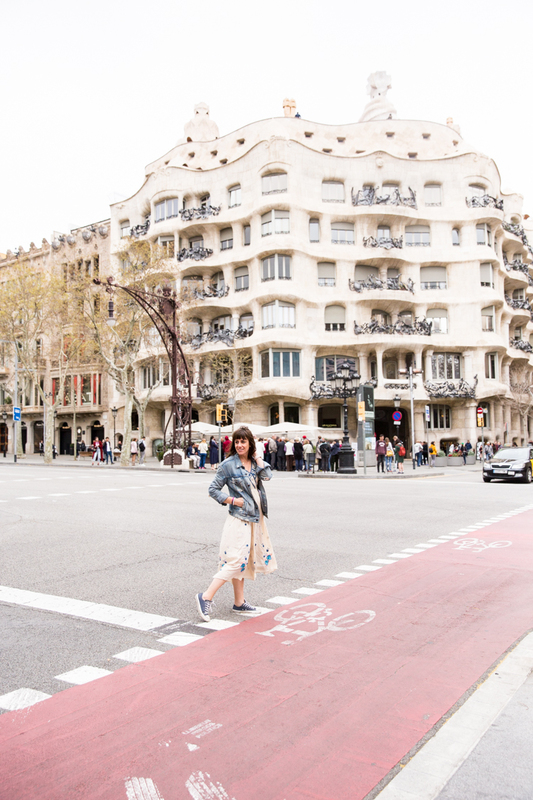 From there, we caught a taxi over to Casa Mila and Casa Batlo, both nearby each other nearer the city center. We didn’t do interior tours, just enjoyed the outsides. Casa Batlo was under construction, so we just saw the scaffolding design and saw photos of it in the gift shop. Next on our Gaudi Day Tour was Parc Guell. It was really fun to have a “Gaudi Day” and see a lot of his works back-to-back. 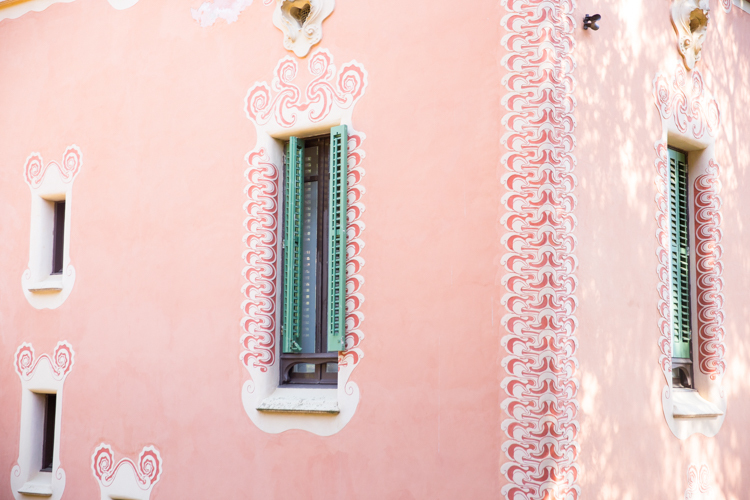 The Parc Guell was intended to be a planned housing community, but only two homes were ever built there, including the pink house where Gaudi lived by himself. The entrance is grand, with mosaic all over, some cool columns, odd walkways and winding benches. We did do a tour of his own house, which was fun, short, and informative. Honestly, I didn’t have any idea who Antoni Gaudi was before the trip, and now I really appreciate his work. We headed toward Palau La Musica Catalana, where we had tickets for the 9:30pm Flamenco Show, and stopped for chocolate and churros on the way. This local specialty is available in almost every cafe and is so good. The Palau itself is a really incredible building, and the flamenco show was so good. The dancers were energetic, talented, dramatic, and really communicated the story of the traditional dance. We loved it. I would highly recommend this exact show to anyone visiting. There are flamenco shows all over, some even in restaurants, but the Palau La Musica is the perfect backdrop. My older sister, who is a travel genius, planned the whole Spain itinerary, and she nailed it. 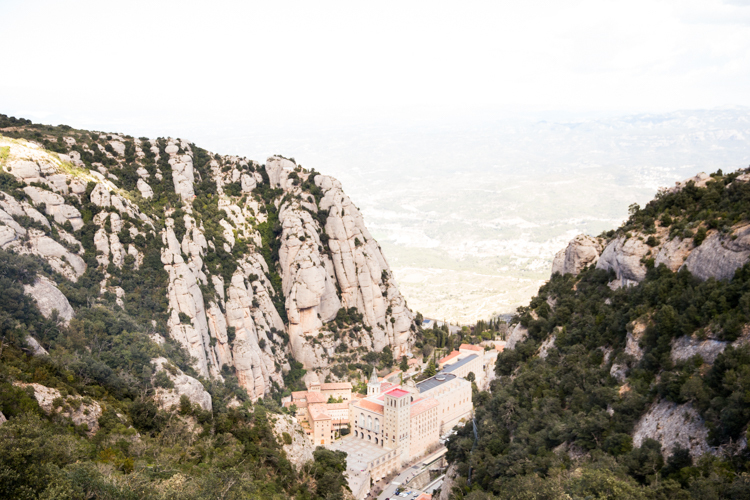 I had never heard of Monserrat, a 900-year-old monastery and community built on top of a mountain an hour outside of the city. We grabbed a quick breakfast as well as sandwiches, chips, and drinks at a cafe in the metro station on our way out to the mountain. 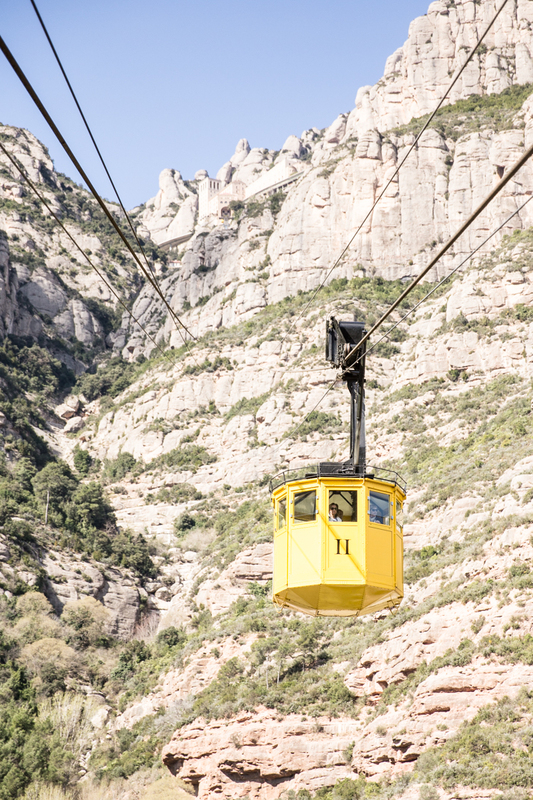 If you take the metro to the train line, you can buy a round-trip ticket for Monserrat that includes the train ride, Cable Car, as well as one of the Funicular rides up on the mountain. The metro we needed to take was apparently broken for a few stops, so the transport employees were recommending we try to go a different day, but we only had one more day of the trip and instead decided to make it work. One kind security guard told us to take a different train a few stops down the line, and that from there we skipped the broken section of track. It worked beautifully, and we were able to get on the train out of town just an hour or so later than we had planned. The train ride was pretty, and I mostly slept. You get off the train in the same station as the mountain trams, which is easy and convenient. The yellow trams hold 20-30 people and look pretty spectacular headed up the steep mountainside to the monastery. I don’t love heights, but I did just fine riding, and the ride was smooth. Once on the mountain, we watched a short film about the history of the monastery and it’s resident Virgin Mary. We also were told the boy’s choir would be singing at 1pm, so we took our seats in the ornate, gothic chapel at 12:30 to listen. The boys range in age from 8-14 and were so sweet walking out in their white choir tunics. Once they began, the chapel filled with angelic voices. I took a couple photos and a quick video, then realized that I wanted to really feel and experience this moment. I put down my phone, closed my eyes, and listened to the voices echoing through the vaulted ceilings of this historic place of faith and worship. In closing my eyes, I got to feel it. Feel the music for myself, reflect on my own faith and worship and be present. It was perfect. After listening to the songs, we took the funicular (vertical cable car) up the mountainside a little further to enjoy the view and have the picnic lunch we had packed. If we had more time, this looked like a really fun place to spend a couple hours hiking along the mountainside, meditating, or soaking up the sun. We returned on the tram, train, and metro back to the apartment for a quick five-minute break before heading out to our Spanish Cooking Class. My sister found it for us on AirBnb Experiences, and we all agreed it would be so fun. It was in a cute studio kitchen and because there were six of us, we filled the class! The teacher, Anna, was really kind and a great teacher. In addition to the class, she gave us a bunch of shopping and restaurant recommendations. In the class we made virgin sangria, which is basically grape juice with cut citrus, other fruit, and cinnamon added and left alone to steep in the fridge. It was refreshing and good. Normally made with cheap wine, this was a fun way to make it non-alcoholic. Next we prepared a Crema Catalana, which is a light Spanish pudding, sort of like creme brûlée. It was simple with milk, eggs, sugar, and corn starch, with cinnamon and lemon peel to flavor. We let the creme chill while we made the Shrimp and Chicken Paella. I have eaten paella several times and really like it, so it was fun to see it start to finish, made in a traditional way. Anna talked about how Paella is a countryside food, was traditionally made for a crowd with chicken or rabbit and hard garden vegetables. We made the sofrito with salt, olive oil, garlic, and then added the shrimp to add flavor, took out out and added the chicken to pre-cook and get the fat. Then we added cut snap peas, bomba rice, and purred tomato. Once the rice looked cooked a bit, we added hot chicken broth, saffron, and rosemary sprigs, then left it alone to cook. Anna said no stirring, and no adding more broth, so if we needed to slow the cooking, we could cover the pan or reduce the heat. After about 15-20 minutes the broth had reduced, and the rice was crispy around the edges. A sign of a good paella. We ate it with wooden spoons straight from the pan. Then, torched some sugar onto our creme for dessert. 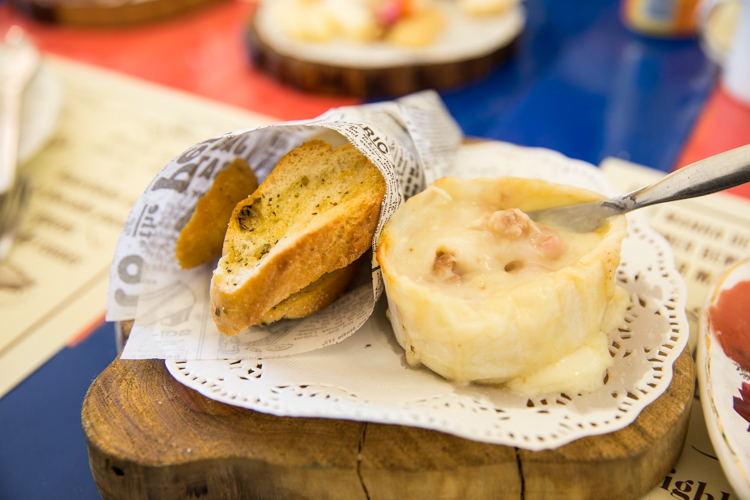 The whole experience was unique, wonderful, and a really fun way to get to know more about the Spanish food culture. The last day of the trip came so quickly, as they always tend to do. We decided to begin with a slow morning, eating a show-stopping brunch at Brunch + Cake by the Sea. Seriously amazing. Most of the other days of the trip we had simple breakfast on the go, so it was nice to stop and have a really amazing brunch. Our next stop was the Picasso Museum in El Born neighborhood. It was fun to learn more about his early life and see a wide collection of his paintings. Then, our shopping day began. 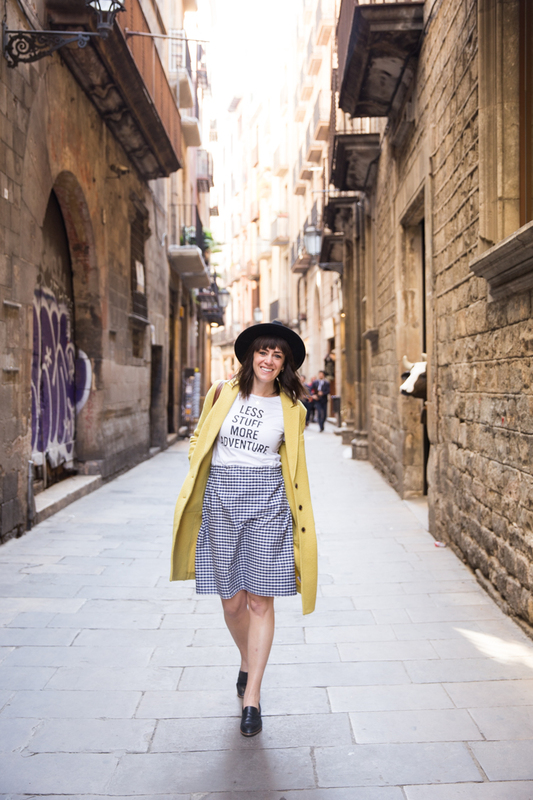 El Born is a cute area for shopping, because it has a lot of smaller, more local boutiques. Tiny Cottons is not local, but is a really cute (expensive) children’s store on the corner near the museum. The streets are narrow and really fun. I wanted to find a pair of handmade Avarva shoes, which I found in a tiny shop called Hand Made along these streets. The Gothic Quarter is another fun area with lots of little shops and cafes as well as narrow alleyways. Along Las Ramblas you can visit the food market, La Boqueria and also find a bunch of (cheap) souvenir shops and flowers stands. We had lunch at 4 Gats, famed as Pablo Picasso’s favorite spot in town. The food was amazing (and we got a GIANT paella that no one could finish.) After shopping and wandering all day, we finished off the evening with a final round of tapas and dessert at Arcano. Now here I am, thirty minutes from landing back in Virgina, so happy to get home to my kids and share photos, videos, and stories from a really fun week abroad with my family. My bags are full of chocolate, sardines, and a handbag, and my heart is full of memories, love, and fresh inspiration for a beautiful life. One thing I really loved this trip, was the forced break from being online. The phone service was terrible (even with my international data plan), and the wifi was spotty. I kept my phone on airplane mode basically all day every day and just logged on at the end of the night to upload photos and check in with Dave and the kids. I realized how present it made me feel in any moment because I was unaware and unconcerned of what was happening online. I wasn’t trying to live a dual life as an avatar and a human. I just got to be me, where I was. This is one habit that I am going to try to bring home with me. Leaving my phone on airplane mode except for certain, intentional moments that I want to log in to check emails, post and interact on social media. It will help me stay grounded, focused, and present in my daily existence to only have to be concerned about what I am actually doing with my physical self, rather than also maintaining a constant online presence. I am relieved just thinking about it. Another thing I loved learning and remembering this trip is how important it is to do what you love and stay true to yourself. So many of the places we saw—castles, museums, and architecture— were created because someone had a vision and worked hard to bring it to life, even when no one else understood or agreed. Real creativity and genius lives in the place where one steps into the unknown. That’s where the magic happens. I’m already planning a paella, sangria, pastel de nada night at home with the kids this weekend, and hope to continue to learn from and enjoy this experience for years to come.